Percy Yutar led the case against the anti-apartheid revolutionary. What did victory cost him? My friend David is telling me about his father, Percy Yutar. We’re sitting in a sunny apartment in the neighborhood of Tamboerskloof, Cape Town. In the distance, through the window, a bright bank of clouds courses over Table Mountain. Percy was the prosecutor who secured convictions against Nelson Mandela and seven others fifty years ago in what was called the Rivonia Trial—​a pivotal moment in South African history—​Mandela going off to his twenty-​seven years in prison for fighting against the system of apartheid. David is uncomfortable, I can tell. Throughout the conversations about his father we would have over the course of the next few weeks, I could sense his inner conflict as he tried to balance loyalty with a more critical viewpoint. The reason I know David, and the reason I wanted to find out about his father, is because our family histories intertwine. I was born in South Africa and so were my parents. My mom and dad left for political reasons in 1986. Apartheid was still in place, and they didn’t want to continue to benefit, as they and their friends had, from the cheap labor wrung out by such a system. My grandparents lived in relative wealth in a suburb of Johannesburg. They had bridge games and servants and gin and tonics by the pool, the whole postcolonial deal. It doesn’t account for the complexities of being human to judge them for not, at any point, apprising themselves of the injustice around them and trying to do something about it. There are many instances of the grace and kindness they exhibited in difficult lives that included, among other things, the loss of a son to a car accident. Yet there were people like them who, though also steeped in their own circumstances, did break away and work against apartheid. My mom tells a story: We’re hung up at the airport, on our way to the US. The grind of moving an entire young family across an ocean has been set in motion but some bureaucratic detail is throwing the whole thing into question. She calls my grandmother in tears—​can she think of anything? And my grandmother calls the one person she knows who might be able to help. Many years later I found out it was Percy Yutar, a man who had come to be seen as one of the principal villains of the apartheid era. Who was this man, this functionary of the state, who stood across the court from one of the great heroes of our time? What happened to men like him after the ground shifted and the system they worked for came to light in all of its corruption? After all those years went by, did he have regrets? One of eight children, Percy was born to Jewish Lithuanian immigrants in Cape Town in 1911. They didn’t have a lot of money; his main toy was the tire from a car. By all accounts, Percy was a different person before the incident, lazy and unmotivated; afterward, a potent mix of ego and insecurity seeded the dogged ambition that would course through the rest of his life. But there was another thread, too, something that would exist uneasily alongside the drive that would take him to the highest offices of South Africa: his religion. He attended the University of Cape Town on scholarship, and in 1937 received his doctorate in law. But despite his top-​shelf education, anti-​Semitism dictated that he would work, for five years, in a lowly position at the post office, tracking down people who owed money. It was this anti-​Semitism he sought to overcome, to prove to everyone that a Jew could ascend to the highest offices, and, later, to prove that he could do the government’s bidding just as well as any steadfast Afrikaner. But this was all much later, after when, as deputy attorney general, he was presented with a case in which a raid on a farmhouse in a quiet suburb called Rivonia yielded a bumper crop of evidence against a group of people who had been agitating for a while, and now were considering a violent overthrow of the government. One of them was Nelson Mandela. In South Africa in 1963, the grip of apartheid was ever tightening under the Afrikaner-​dominated National Party that had come to power in 1948. Black Africans, or “Bantu,” which was the blanket term for people of color, were told where to live as dictated by the Group Areas Act. They were prevented from receiving any education beyond what was needed to be a domestic servant as decreed by the Bantu Education Act. “Pass” laws required them to produce a book, or “dompas,” whenever they were outside of their designated areas, and only whites could vote. It was “a separation that exceeded even the pernicious Jim Crow laws of the American South in scope and force,” says Kenneth Broun in his book Saving Nelson Mandela. The Sharpeville Massacre of 1960, in which sixty-​nine people were shot to death while protesting the pass laws, was still fresh in people’s minds, and black militancy was increasing along with white fear. Picture a land of silty, ramshackle, corrugated townships spread out over the Lowveld, from where domestic and office workers would leave and get shunted back to at the end of the day, all mere miles from the peaceful and elegant streets that still compose the suburbs of white-​inhabited Johannesburg: Cape Dutch-​style houses, manicured lawns, and midday birdsong. In fact, Goldreich was a member of the banned South African Communist Party, which had purchased the house through a dummy corporation to serve as a meeting place for an underground organization called Umkhonto we Sizwe (trans: “Spear of the Nation”) or MK, culled from members of the Communist Party and the African National Congress and formed to discuss military action against the government. For a period of time, Nelson Mandela posed as a gardener working under the name David Motsamayi. The police, who arrived undercover in a dry-​cleaning truck, found them in the middle of a meeting, all of their materials out on the table. Walter Sisulu, Denis Goldberg, Govan Mbeki (father of future South African president Thabo Mbeki), Ahmed Mohamed Kathrada, Lionel “Rusty” Bernstein, Raymond Mhlaba, James Kantor, Elias Motsoaledi, and Andrew Mlangeni were apprehended at the site, as were Goldreich and Harold Wolpe, though they later escaped. Mandela, who’d left in 1962 and was serving a prison sentence elsewhere, was also indicted by the evidence. These were the names that filled the docket given to Percy Yutar. Ambitious as he was, he must have known that the case would bring him national recognition. Here was a group that wanted to upend the whole white ruling caste he was ascending. Here was a chance to showcase his legal prowess and affinity to the government. The charge he formulated: sabotage. 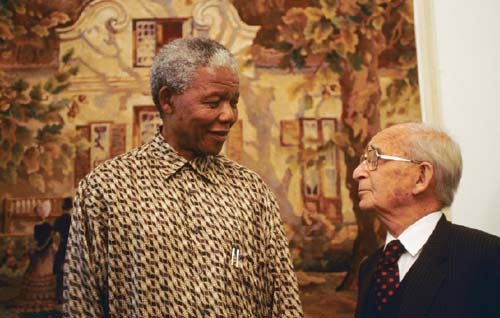 “He was a sneaky, snide, arrogant, I suppose I have to call him a person,” said Denis Goldberg when I met him at his house in Hout Bay, Cape Town. A civil engineer by training, and a member of the Communist Party from a young age, Goldberg was on the logistics committee of MK. After the Rivonia Trial, he spent twenty-​two years in prison. A large man, Goldberg has a removed kind of intelligence, as if looking at you from a great height. I had to ring the bell a few times, and he came to the door in the befuddled torpor of someone who’d just woken from a nap. We started talking as he rummaged around in his cabinets for a water glass. But Goldberg told a number of stories that corroborated other accounts I’d read about Percy and his courtroom manner. That there was a strange, misplaced bombast in his delivery, and a flamboyance that would belie any assumption of dispassionate objectivity. “Yutar in court used his attitudes of racial superiority to try to humiliate,” he said. So preposterous to Yutar were the political positions of the accused that, in a sarcastic exercise, he named what he called a “shadow cabinet for the provisional revolutionary government.” He nominated Goldberg Minister of Health; Kathrada was to be Minister of Indian Affairs; Sisulu would be Minister of the Interior, and Mandela Minister of Defense. “He was making fun of each of us,” says Goldberg. In a different incident, Vernon Berrange, an advocate for the defense, called Percy petty: “You’re such a little man,” he’d said. According to Goldberg, Yutar refused to speak to the defense team afterward. “Well, you can’t run a trial if the prosecution and the defense aren’t coordinating.” So, George Bizos, another attorney on the defense team, went to smooth things over and told Percy that by “little” Berrange hadn’t meant he was of small stature, just that he was small-​minded. I have cherished the ideal of a democratic and free society in which all persons live together in harmony and with equal opportunities. It is an ideal for which I hope to live for, and to see realized. But if needs be, it is an ideal for which I am prepared to die. In the end, eight of the defendants were given sentences of life imprisonment. It was a great relief to many who thought they were going to hang. Over the course of a few weeks in Cape Town, David Yutar gave me a number of materials relating to his father. There were newspaper clippings Percy had cut out and saved, mostly laudatory articles from Afrikaans newspapers from the time of the trial. There was a hand-​drawn card a client had made for Percy in thanks for legal work. The most illuminating thing was a twenty-​three-​page document, the preface to Percy’s unfinished memoirs. It was written sometime in the midnineties and has the feel of someone trying to set things straight. “His claim that he saved their lives is a damn lie,” said George Bizos, one of the advocates in the trial, who remains a good friend of Mandela’s. We were sitting on a pretty, cool stoop, overhung with leaves at his house in Johannesburg. He drifted in and out of memories. A little boy, the son of a friend, rooted around in the garden next to us. He referenced a particularly nasty part of the trial: Yutar’s cross-​examination of Cry, the Beloved Country author Alan Paton who was there to speak in mitigation of sentence. Paton spoke about the courage and determination of the defendants and their desire to lead better lives. He outlined his opposition to violence but said he could understand why they had come to feel they had no other option. “I told him what my mission was,” said Bizos, and then something strange happened. “He started crying.” Yutar related how he and his wife had waited for twelve years to conceive and so understood where Bizos’s friends were coming from. He immediately worked up the necessary certificate. There’s a certain twitchy evasiveness you get in some white South Africans when it comes to talking about apartheid. It’s as if they’ve already done all of their thinking about it and don’t want to dig it all up again and are furthermore slightly annoyed to encounter some outsider who’s bringing it all up as if it’s 1990 and Nelson Mandela has just been released. It was a variation of this attitude I encountered in Dawn Sprighton, Percy’s secretary of two decades. It was as if by the sheer blinding force of her good nature and grinding manners we could avoid any of the unpleasant shadings inherent in a conversation about his life. I met her on a hot afternoon in the Johannesburg suburb of Sandton, in an orange-​colored housing complex typical of the area in that it was surrounded by high walls, a security system, and guards. It became clear pretty soon upon sitting down with Sprighton that there wasn’t going to be any sifting or searching when it came to questions about Yutar. She spoke of him with unalloyed admiration. She became his secretary when he first joined the bar in 1979, fifteen years after the end of the trial, and worked for him for more than twenty years. They’d developed a frothy friendship, and she describes being chased around the table by him, little pranks he used to play that drew on her inexperience with the Afrikaans language, and also his generosity—​how for her birthday he rented out a room at a tony hotel where she had lunch with her friends, and she’d only been there a year. Minute gearshifts in her manner told me that she wasn’t comfortable discussing the politics of the time or how Yutar factored into them. Yet she was adamant when I brought up the whole sabotage-​versus-​treason thing that yes, he did, in fact, save the accuseds’ lives and that was his intention the whole time, even though she met him fifteen years after the trial was completed, when the ground had shifted and Yutar had had plenty of time to impose that narrative to anyone who might ask. I reiterated the question, not sure she’d understood. Our meeting ended soon after that, when her cousin appeared and we crowded around as she flipped through a scrapbook of safari animals, all of us relieved to be talking about something as simple as giraffes, if we had seen one in the wild yet, and how they were definitely a mutual source of delight. Gary Mazaham met me at a modern office park not far from where I met Sprighton. He opened a heavy glass door to greet me and apologized profusely for his appearance even though he was wearing immaculate tennis whites. We sat down at a glossy conference table. But what about the context? Shouldn’t Percy, especially because of his experience with discrimination, have seen the environment the accused were reacting to and refused to take the case? But where had all the money gone? Did he think his father had any, even if he didn’t express them? We visited Robben Island on a clear and pretty morning in late January. There’s a sun-​bleached, deserted, windswept feel to the whole place. Large buses take you around the grounds and have to stop now and then to let a turtle cross the road. You can see the cell where Mandela spent eighteen years of his sentence. It contains a bucket, a floor mat for sleeping, and a desk. You can see the courtyard where prisoners hammered stones into gravel day in and day out. The prison guide had been interned there for a number of years. He said that before he was sentenced he’d been strapped to a chair and given electric shocks. “I told them everything.” A detail I can’t get out of my head: Black prisoners had to wear shorts instead of pants—​it was to infantilize them, so they would forever be just “boys” in the eyes of their guards. David told me once, and my parents have said it, too: It’s extraordinary, but you can’t find anyone now who was pro-​government during the apartheid era. It wasn’t that long ago that it was dissolved, and the system would have required the complicity if not the active support of a great many people. But they’ve all disappeared. It seems that everyone has rewritten their own histories. Did Percy Yutar have the fates of the accused in mind, as he later claimed, when he formulated the charge of sabotage? Or did he pick the path of least resistance to a splashy trial that would showcase him as defender of the state? It seems the only thing that can be said definitively is that there’s no evidence that he did anything, at any time, big or small, along the way, to resist the status quo, and in fact seemed to relish in the authority vested in him as prosecutor. We all know what happened. Mandela was released and elected to president, inheriting the government and opting for truth and reconciliation rather than revenge. In that vein, he had lunch with Percy Yutar in 1995. You can only imagine what they talked about. “I tried to grill him and he was singularly unhelpful,” David said. “My father was not very forthcoming on that.” In footage of the press conference for the lunch, Mandela towers over his former prosecutor. He seems determined to make Percy—​now a very old man, with wispy gray hair and a polka-​dot tie—​feel comfortable. He lightly puts his arm around him. He listens gravely as Percy makes a short speech. At one point he gently ribs him, “I thought he was taller than this.” “His part was a small one,” he says at another point, in response to a reporter’s question. Yutar looks, above all, grateful. Emma Rathbone’s first novel is The Patterns of Paper Monsters (Reagan Arthur, 2010). Her writing has appeared on FiveChapters, The Millions, and the New Yorker blog. She was a Henry Hoyns Fellow at the University of Virginia, where she received her MFA in 2006. She teaches fiction writing in Charlottesville, Virginia.